The Special Collections department of Middlebury College in Vermont is now the proud owner of the typed short story which is signed at the end in pencil "By Sylvia." The catalog entry at Middlebury summarizes the story thus: "The story follows a young boy who comes to live with Aunt Rennie and the elves after being sent into the forest by his cruel stepfather". The story features two clipped illustrations from a product called Junket Rennet Powder by Vernon Grant. 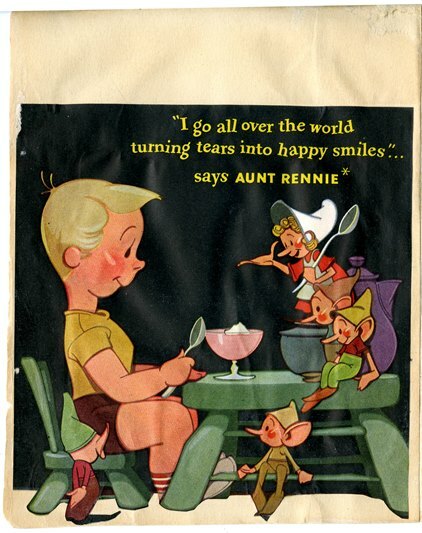 The advert, entered into US copyright on 29 January 1943, reads, "I go all over the world turning tears into happy smiles"... says Aunt Rennie. 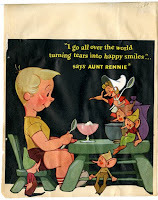 The full advert, right, shows a recipe for their rennet-custard desserts, was found on Pintrest from an eBay auction. I am really happy to find where this early short story, from circa 1943, is held now. It is now listed on the Archival Materials page of A celebration, this is. But wait, there's more. 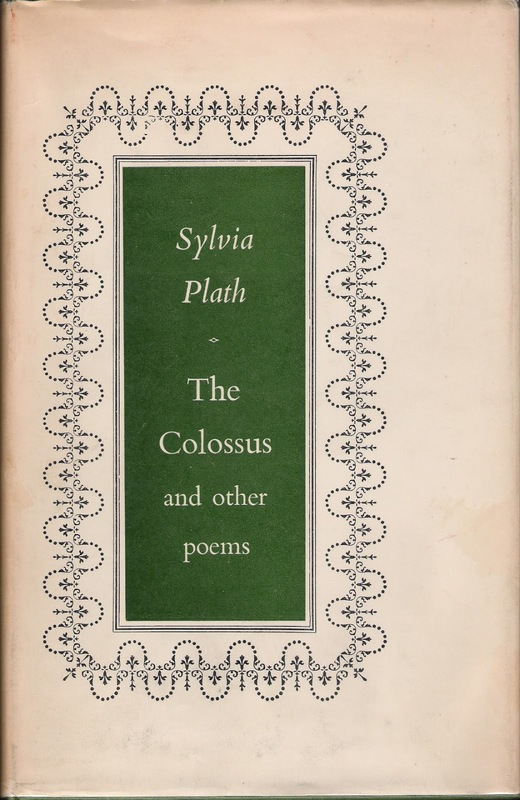 The Special Collections has a rich and healthy number of Sylvia Plath books, too. Included among them are a first Heinemann edition of The Colossus (1960), A Winter Ship (1960) , a Victoria Lucas edition of The Bell Jar (purchased in 1987 for $500!) as well as other first and limited editions. My most sincere thanks to Nellie Pierce for her help. 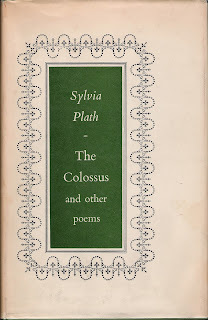 This blog was posted from Gail Crowther's house, which is very special for me as it was my first ever visit here and it is Sylvia Plath's birthday. All links accessed 14 September 2018. Tomorrow at 19.00, the British Library will host the event "Triple-threat woman: The Letters of Sylvia Plath". I will be speaking with the co-editor Karen V. Kukil; and we are joined by Heather Clark and Mark Ford. We have, each, fifteen minutes each to discuss various aspects of Plath's letters selected from those included in Volume II. It was difficult to find a few examples from the 575 letters in the book. I have titled my piece "The Reception of Sylvia Plath". Here's my title slide. I am looking forward to the event; to see old friends and make new ones. All links accessed 18 October 2018. One cannot read and work with Sylvia Plath's letters, diaries, scrapbooks, or pocket calendars without noticing a trend. She loved movies, plays, and late in her life, the opera. She took in a film whenever and wherever she could in Wellesley, Boston, the Cape, Northampton, Cambridge (US and UK), London, and New York, to name several cities she cultivated in her quest for culture. When I was working on the Letters of Sylvia Plath, I included the cinema or theater name for the films, plays, etc. that she attended. I did this for a couple of reasons, one of which was this kind of information interested me and so I felt compelled to record it in case there are other like minded Plath readers out there. I wrote a little about this recently on Gail Crowther's website in a piece called "The Archival Stretch". 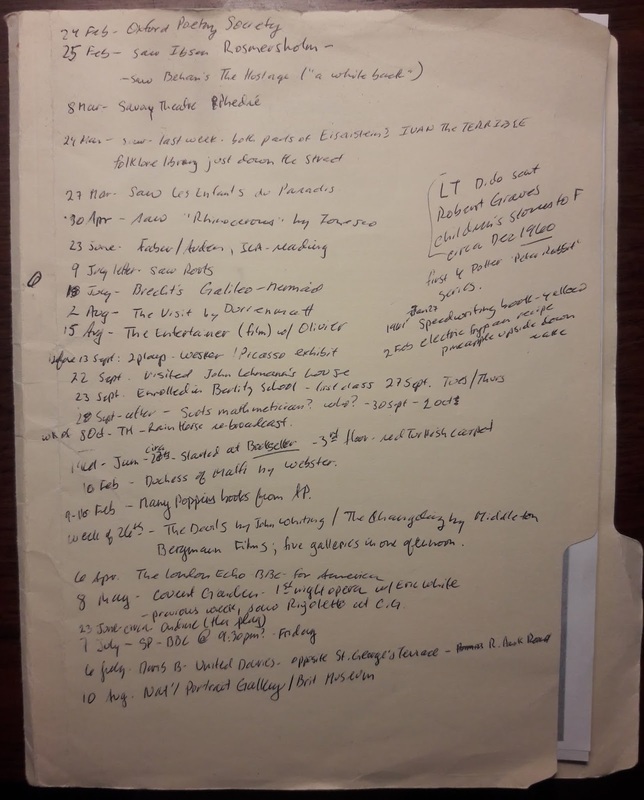 After a while of repeatedly seeing reference to these events, I decided to compile a list of all the films, plays, and what not that Plath took in using all the resources that I had available to me. 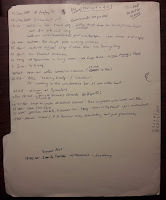 I kept a list of them (and other noteworthy notes) on a folder and the worked on transcribing that into a Word document. This is not a fully comprehensive list because, for example, there are no pocket (or personal) calendars for 1957-1961 that we know of. Plath did see a film with Susan O'Neill-Roe and her then boyfriend, Corin Stanton-Hughes in January 1963. 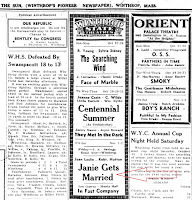 She wrote on 16 January 1963, "Sue & her sweet boyfriend Corin took me out to a movie the other night" (Letters Vol 2, 958). However, the film is not named. 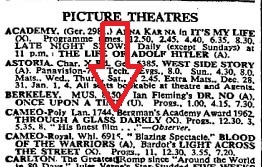 One can see what films were on at the time but one can at the moment only guess which it was. After this long pre-amble, this blog post is to simply announce that the bibliography of films, plays, etc. that Plath saw is now available as a PDF on A celebration, this is, my website for Sylvia Plath. I had to wait to post this until both volumes of Plath's letters were published as the information in them was under strict embargo by the publisher. 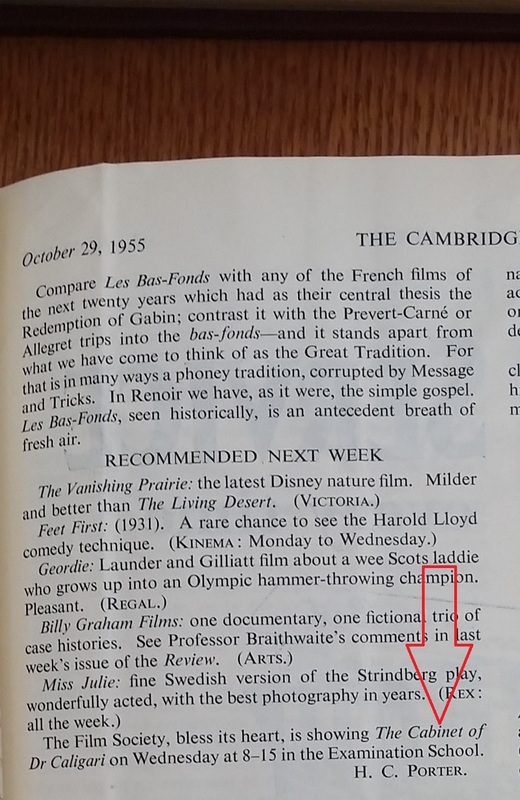 Here are some of the listings for events Plath took in: Janie Gets Married; a concert on the Esplanade in Boston; The Cabinet of Dr Caligari; Galileo; and Through a Glass Darkly! If I ever learn of new things to add I will do so; and of course if you spot any errors please do let me know. All links accessed: 27 August 2018. October is American Archives Month in the US, so let us look at the first of a few Sylvia Plath Collections I have been sitting on for years! As with much else at the Pierpont Morgan Library in New York City, their Sylvia Plath holdings are remarkable. As of 14 March 2017, the catalog returns more than 100 records when searching all collections. Certain collections are not applicable, such as Medieval Images Only and Music Manuscripts and Books. But, of those records there are treasures lurking any reasonable way you sort it. The items discussed in this post were worked with one day in January 2017 and the excessive delay in posting about it was due to the embargo on anything to the with Plath's letters. 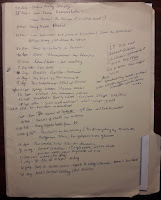 My reason for the trip was to work with the letters from Plath to the Merwins and to William and Edith Hughes. If you want limited editions and rare books, the Morgan Library has something for you to look at. 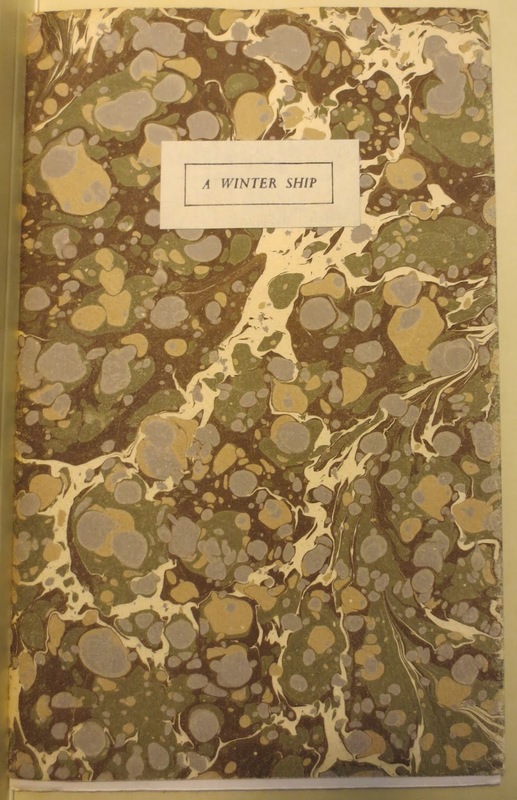 They have several copies of the rare printing of A Winter Ship, including some proofs, an original letter from Ted Hughes to the Tragara Press owner Alan Anderson which includes a typescript copy of "A Winter Ship", and two original letters by Sylvia Plath to Anderson. It was good to find these as Smith College has photocopies but lacked the envelope on which Plath added a postscript. The postscript is fascinating as it was intended for Plath's mother and concerned her childhood friend Betsy Powley Wallingford. 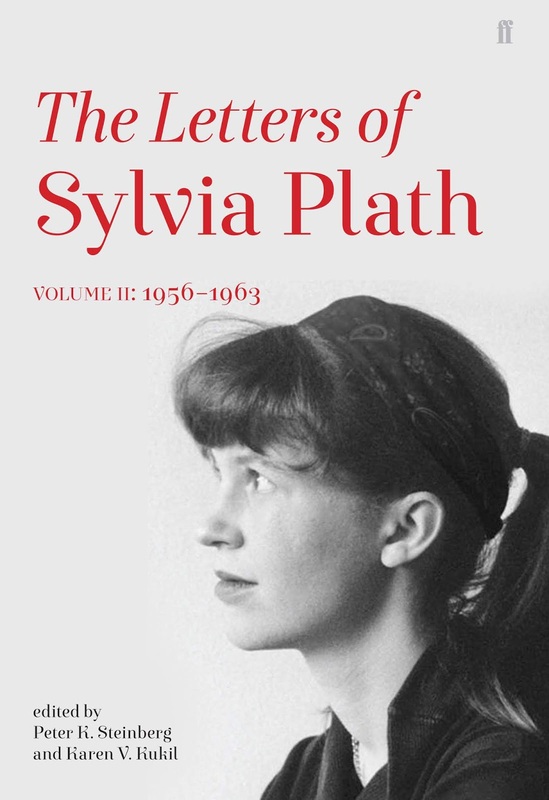 Plath sent a letter the same day to her mother and simply wrote the PS on the wrong envelope... Other limited editions include Above the Oxbow, Fiesta Melons, and The Surgeon at 2 a.m. & other poems to list just a few. The Morgan also has numerous publications in which Plath's works first appeared including several of The Phillipian from the mid-1940s. Additionally some late publications like London Magazine and The New Statesman, and much, much, more, of course. Some of these holdings are in the general special collections and were purchased through normal collecting and via auction. This blog has featured a couple of their early poetry manuscripts (4 July 2007, 17 August 2007, and 23 September 2009) that were purchased in the 1982 Sotheby's auction (Lot 96). A great many form part of the Carter Burden Collection of American Literature. Additionally, I worked with several of the holdings in the Burden Collection and thought it would be good to finally blog about them, to bring them into greater awareness, perhaps? This was a Thursday. Plath's mother was due to arrive for a visit the following week. 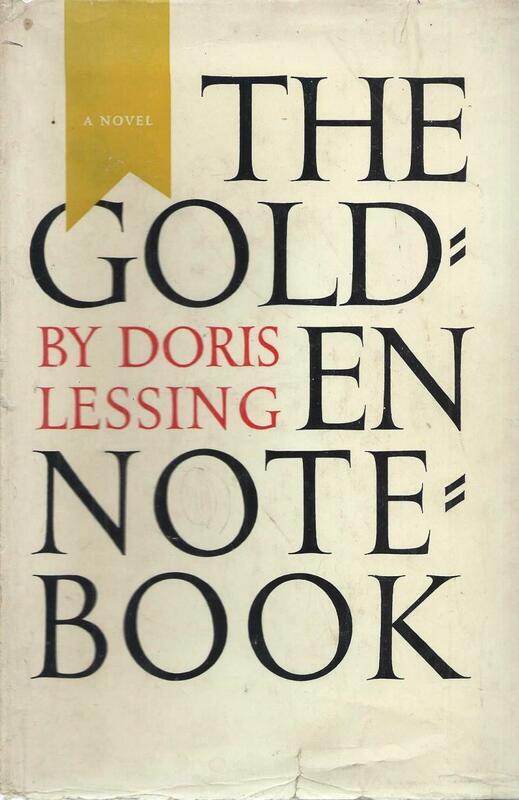 There is no indication in Plath's 1962 Royal Letts Diary Tablet to indicate if Lessing visited them that day, which according to Plath's notes was a very busy day for errands and things. So it is a mystery to me… I can only think that Lessing posted it, she visited them, or someone brought it to them. Lessing was friendly with the Macedo's and knew Assia Wevill, so perhaps introductions were made through those contacts? The book shows evidence of being read and is mostly free of any reader marginalia. There are faint pencil marking on pages 20, 44, and 46. While that is undeniably awesome. 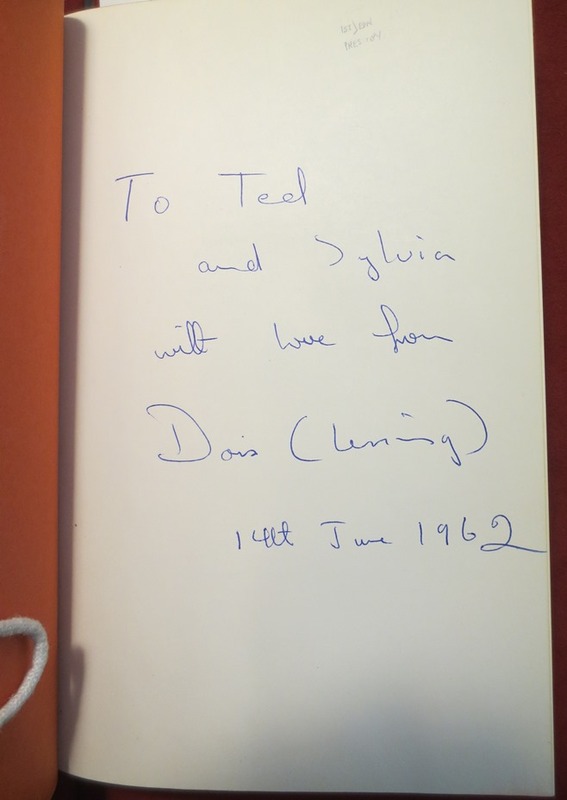 The main reason for my visit were the Plath items concerning Dido and W. S. Merwin which include five letters from Plath to the Merwins (one also contributed to by Ted Hughes), what I believe is a letter fragment from Ted Hughes, and Merwin's copy of Plath's The Colossus. The image here is not Merwin's copy. The letters to the Merwins were ones I had been looking for for some time; and according to the catalog record the Morgan received them from Burden's heirs in 2013. I am unsure if that means they were visible in the catalog at that time but I guess what matters is that they were found. Each letter below has a link to the catalog record which provides some summary information. The first letter they have is misdated and at the time of writing my long email with evidence of the correct date has not yet encouraged them to revise the catalog record. 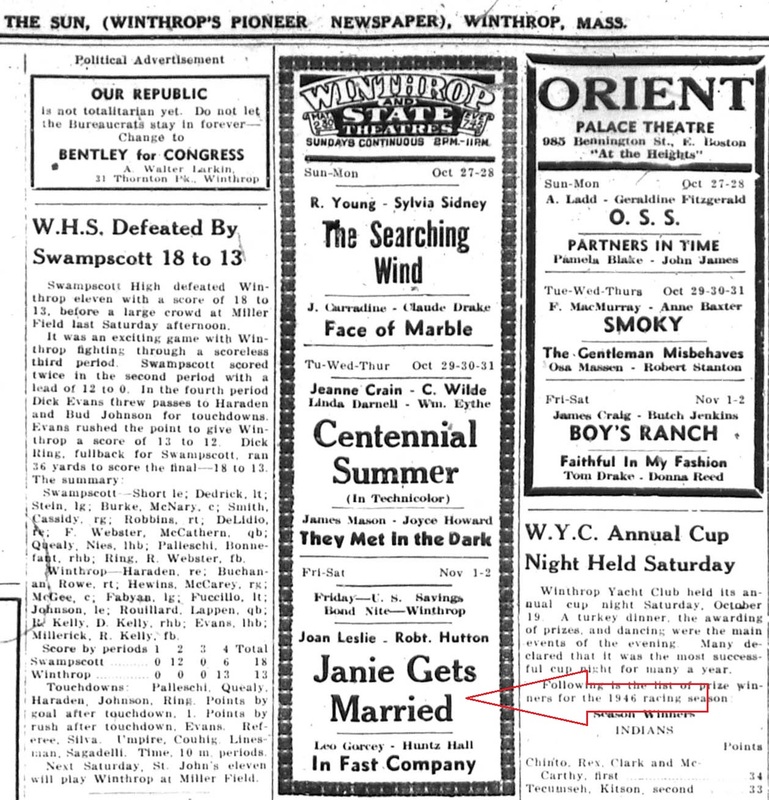 They have it dated 28 February 1960. However, since there is a mention of a sleeping Frieda, that is an impossibility! The letter was actually written on 24 June 1960. The second letter, 7 March 1961, is toward the end of Plath's hospitalization for her appendicitis. 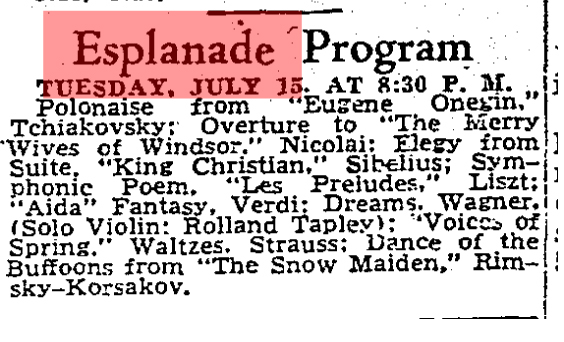 The third letter, circa 30 July 1961, is after their visit to France and Yorkshire. The fourth letter, 8 November 1962, discusses the breakdown of their friendship after the breakdown of Plath's marriage, among other topics. There are two other letters. The first is a partial letter from Hughes to Merwin that they have as being part of the circa 30 July 1961 letter mentioned above. There are clearly two different letters. The earlier one is from just after their return to London after visiting Yorkshire with Plath and Plath's mother and is before they agreed to buy Court Green. The second letter is from after their move to Court Green as it mentions sub-letting their flat to the Wevill's and some other business such as Plath's editing of American Poetry Now. As with the first, misdated letter mentioned above, my recommendations to modified the catalog record have not seen any action yet. The other letter is a carbon of a letter from Merwin to Plath dated 5 November 1962.It was to this letter that Plath responded in her 8 November letter mentioned above. There is also a stray letter from Plath to her in-laws William and Edith Hughes dated 9 October 1961, a month or so after her move to Court Green. 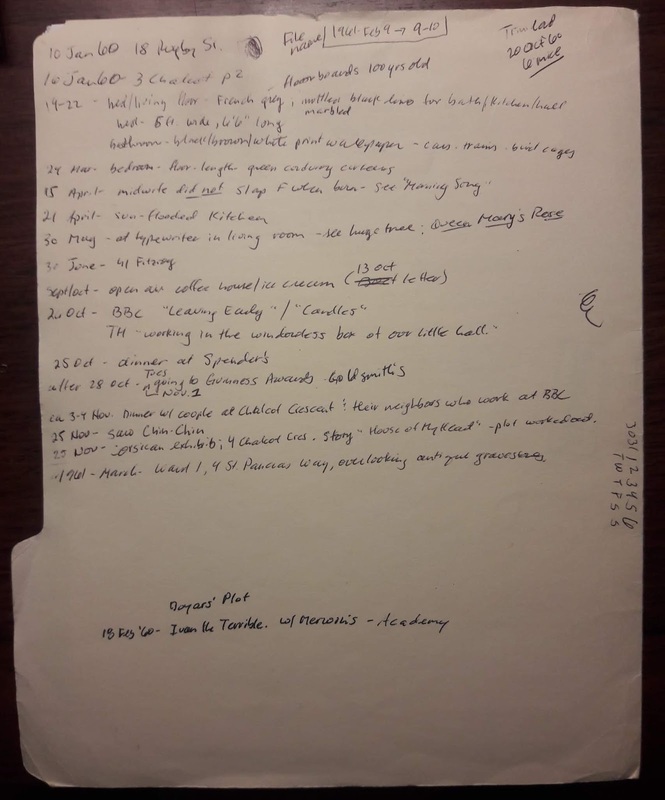 So a wealth of Plath related archival materials in the form of poems, manuscripts, typescripts, books, periodicals, and more. It was brilliant to get to work with these papers, to visit the reading room again, and spend a day in New York City. If you are ever in or near New York City, please do drop by the Morgan: but write well in advance, admission to the reading room is by appointment/approval only. 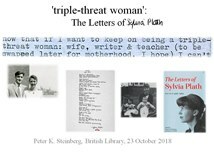 The British Library will host an event on 23 October 2018 entitled "Triple-Threat Woman: The Letters of Sylvia Plath". Tickets went on sale on 10 September and it has been exciting to see and hear of people making bookings. This blog post is simply to reiterate the information on the British Library events page. 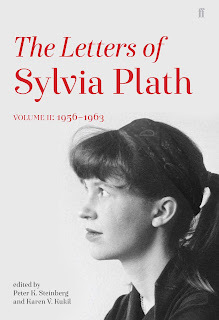 Poet and novelist Sylvia Plath was a great letter writer, and a newly published collection (The Letters of Sylvia Plath Volume II: 1956–1963, Faber and Faber) gathers letters from the period when she wrote her best-known works Ariel and The Bell Jar. Join the editors Peter K Steinberg and Karen V Kukil, and leading Plath scholars Heather Clark and Mark Ford, to explore the insights that they provide into her life and work. Alternating reflections on literature with quotidian episodes, the letters offer insights about her life as an American woman in England in the late 1950s and 60s, and her experience with writing, her marriage to Ted Hughes and motherhood. Heather Clark is the author of two award-winning books on 20th-century poetry: The Ulster Renaissance: Poetry in Belfast 1962-1972 and The Grief of Influence: Sylvia Plath and Ted Hughes (2011) both published by Oxford University Press. Her biography of Sylvia Plath will be published by in 2019. Mark Ford is a poet, critic and Head of the Department of English Language and Literature at University College London. He has written four collections of poetry: Landlocked (1992), Soft Sift (2001), Six Children (2011), and Enter, Fleeing (2018). Karen V Kukil curates literary manuscripts at Smith College in Northampton, Massachusetts, including the papers of Sylvia Plath and Virginia Woolf. She is the editor of the Journals of Sylvia Plath (2000) and Woolf in the Real World: Selected Papers from the Thirteenth International Conference on Virginia Woolf (2005) and co-editor of the Letters of Sylvia Plath (2 vols. 2017-2018). Kukil's exhibitions include 'No Other Appetite': Sylvia Plath, Ted Hughes, and the Blood Jet of Poetry (Grolier Club, 2005) and One Life: Sylvia Plath (National Portrait Gallery, Washington, D.C, 2018). Archivist Peter K Steinberg is co-editor the Letters of Sylvia Plath (Faber) and co-author of These Ghostly Archives: The Unearthing of Sylvia Plath (2017). He authored the biography Sylvia Plath (2004), the introductions to The Spoken Word: Sylvia Plath (2010) and Sylvia Plath in Devon: A Year's Turning by Elizabeth Sigmund and Gail Crowther (2015), and articles on Plath have appeared in Fine Books & Collections, Notes & Queries, and Plath Profiles. All links accessed 12 September 2018.